Jesse and I have a chest freezer in our bedroom. One of the big perks of moving to our new apartment is that we will get to store the chest freezer in our new second bedroom. I’m sure that having a freezer in a second bedroom is still odd to all of your lucky people who possess garages or basements, but I think it will feel like pure decadence to us. How did we come to have a chest freezer in our bedroom? Well, about a year and a half ago I was slowly losing my mind over getting things to fit in the freezer above our refrigerator. I’d started buying whole chickens from our CSA and they just didn’t fit well into that little freezer, especially when I tried to buy two at a time so as to cut down on how often I needed to drive to the across town pick-up site. I was also buying some packages of grass-fed ground beef and trying to freeze a few pre-cooked meals, and well, you get the idea. The last straw was when we started to consider splitting a quarter of a cow with some friends. There was no way that 40 or so pounds of meat would fit in the above fridge freezer, considering how tight it was already. So we did some research and eventually decided to purchase a small chest freezer. The freezer went in the bedroom because there was absolutely no place for it in the dining room, kitchen or living room, but we did have an available wall in our bedroom once I moved a few things around. 1. Most of the time I don’t need to fight with the freezer to get things to fit. Sure, occasionally I will order too much meat or try to store too many servings of meatballs, but for the most part I just put things in and close the lid. No longer do I have to rearrange a bunch of things in order to get anything new to fit. 2. I can freeze a lot more than I used to be able to. Not just raw meats, which really need to be frozen, but also meals or parts of meals like soups or pre-cooked meats. 3. I can make bigger orders from our CSA or Azure. Our CSA doesn’t always have all the meats I want in stock, so when I see them come in I like to order a lot to hold me for a while. Ten stewing hens definitely won’t fit in my above fridge freezer. Similarly, my Azure order group now only orders every two months, so I always need to stock up on things that may have to go in the freezer. 4. I have enough room for the frozen container for my ice cream maker. Being able to make ice cream makes me happy. If you don’t think you have room for a freezer but really want one anyway, I encourage you to think creatively about the space you have available. Maybe you’ll find an unusual solution that works for you. Do you have a chest freezer? How does it affect your real food life? I'm still so glad you let me know a while back that you had a chest freezer in your bedroom, I love having one now, even if it's in my living room! I keep dreaming of someday having a place where I have enough room for an upright one! Ah, yes, I also lust after an upright freezer. 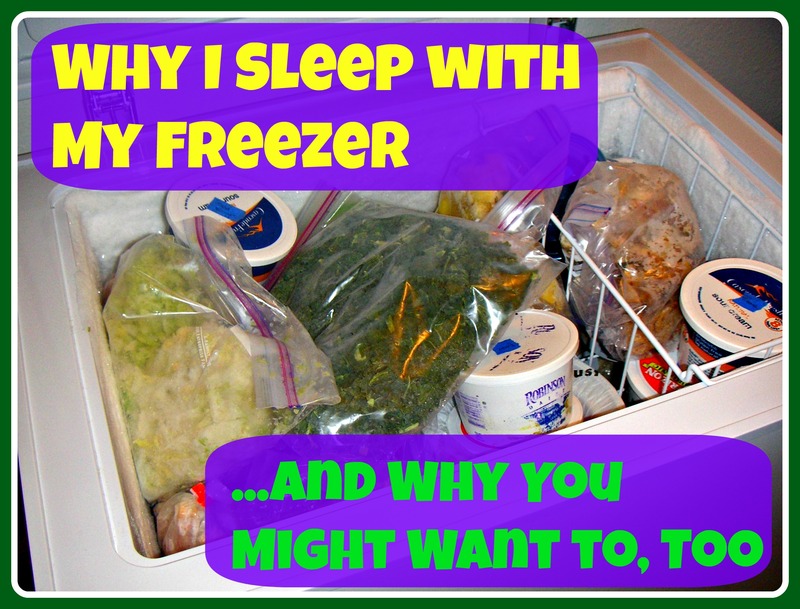 :) I get a little tired of taking everything out when I want to get to the bottom of the chest freezer. Although it's a much nicer experience when I remember to wear gloves. we have a stand alone freezer in our basement- I was so happy to get it- I bought half a grass fed cow! The cow is almost gone- so the freezer is getting empty. time to buy another one I guess. Our quarter cow is almost gone, too. Where did you get your half cow from? We got our cow from Lasater grasslands beef. I found them from eatwild.com I believe. I was really happy with the meat. where di you get yours? Grant? I got our first quarter through Grant Farms; the most recent one was from Windsor Dairy. Thanks for sharing your source. I was curious to do more price comparison for next time. I just love your blog! If you really want it, you will make room for it! I linked to this from my blog's FB page. Thanks for stopping by, Stacy. I love that you asked for a freezer for your wedding. That's brilliant!